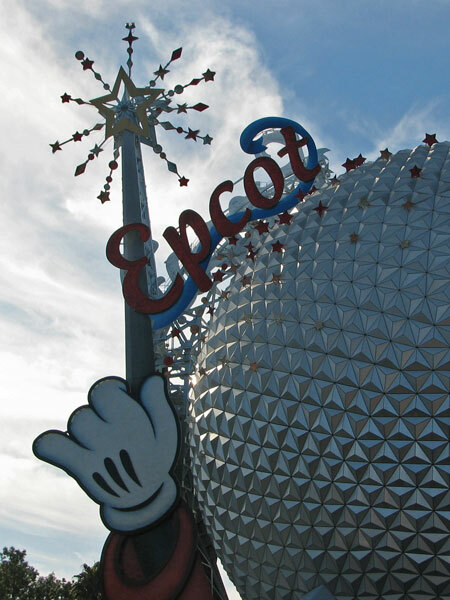 The wand beside Spaceship Earth was erected in 1999 for the Millennium Celebration. It was 257 feet tall—the tallest structure by far at Walt Disney World—and featured a giant, sparkly, illuminated “2000”, arching partway over the geosphere and fashioned like a looping red ribbon trailing from a magic wand held by Mickey Mouse’s hand and tipped with a confetti-covered star. 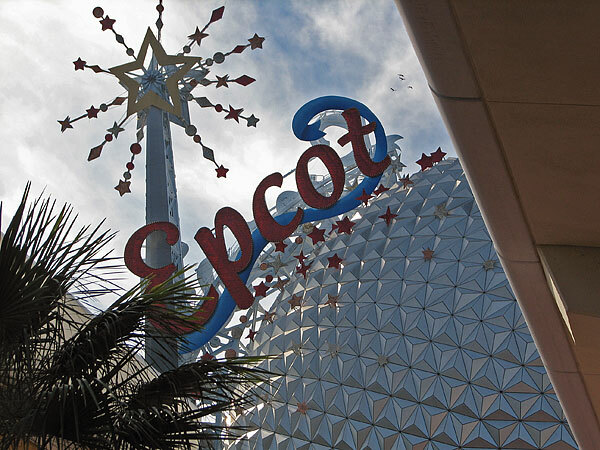 The surface of Spaceship Earth was peppered with dozens of smaller, sparkly stars. Epcot entrance, 25 November 2000. Photo by Jeff Keller. Used with permission. 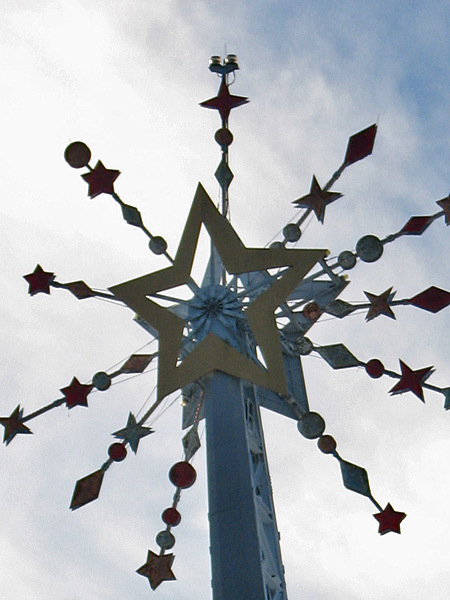 For that celebration, it made sense: The advent of the new millennium was a big thing, and a big gaudy decoration fit the New Year celebration theme. I have to imagine that if they could have made a giant string of party-decoration letters instead, they would have. Epcot wand viewed from under the monorail station, 9 December 2006. 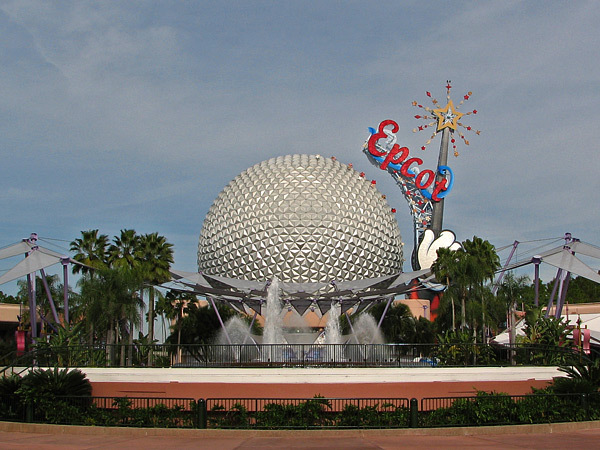 The Epcot wand threatened to become a permanent eyesore, towering over the geometric perfection of Epcot’s trademark geodesic dome (itself arguably the most unique and recognizable structure in any Disney park). 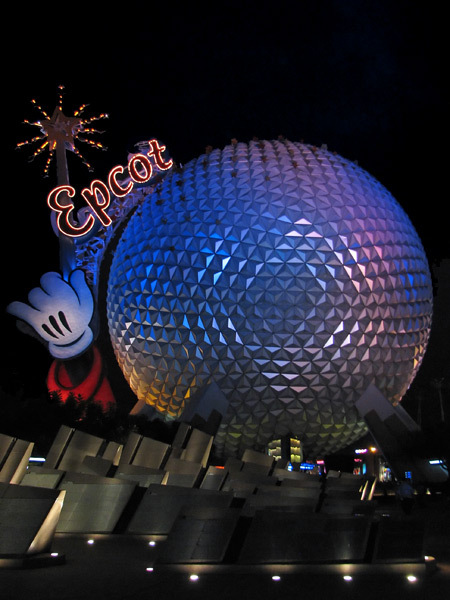 It ruined the scale of Spaceship Earth; it made the astoundingly big sphere look like a toy. Spaceship Earth viewed from inside Epcot, 8 December 2006. The big purple canopy-web thing in Innoventions Plaza further threw off the perspective, as did the clutter of huge “Leave a Legacy” stones blocking both sightline and walking path at the park entrance and looking like a sci-fi war memorial. Epcot entrance, 11 December 2006. But those are topics for another time. The wand always looked like a temporary decoration. Its support structure was visible from all angles, even right at the entrance to the park. Epcot wand, 8 December 2006. Especially looking up from under it. Epcot wand, 9 December 2006. Notice the warning beacons for low-flying aircraft. Disney carefully keeps its tallest structures just under 200 feet, the height at which such lights are mandated by the FAA; no extraneous, non-show-related lighting on anything at Walt Disney World—except the wand. That wand has been the #1 hate-magnet for Epcot fans on the web. “Tear down the wand!” has been the popular battle cry. At least one enthusiast even Photoshopped the fantasy come true. Unattributed image from Re-Imagineering, 16 February 2007. Not the most practical means of execution, seeing as it would destroy several buildings and the monorail track, but…well, desperate times, desperate measures. And times did look desperate. 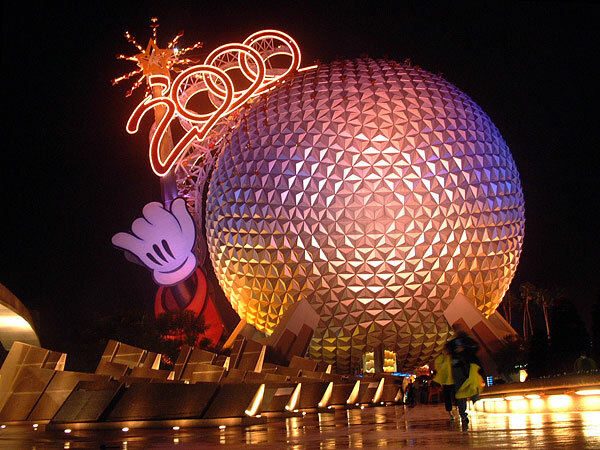 Even just earlier this year, the Vice President of Epcot, Brad Rex, announced that there would be no official celebration of Epcot’s 25th anniversary. There would be “private observances” for the cast members, as if it were a funeral. Well, Brad Rex left for the hotel business. 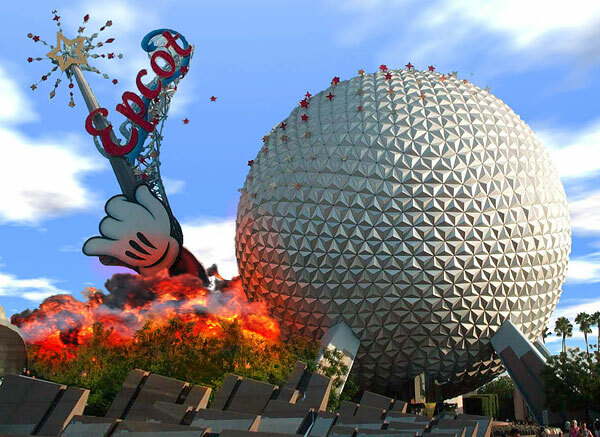 Epcot got a new VP, Jim MacPhee. On July 5, Jim announced that the wand was coming down in time for the 25th anniversary—and there would be a few surprises as well. I’m delighted. 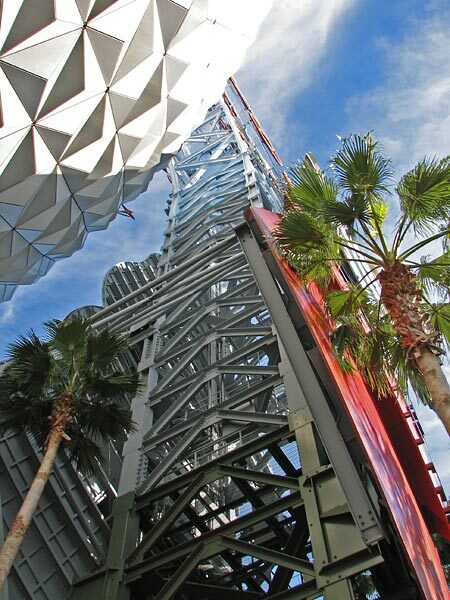 I’m going to Epcot for the anniversary, and I’m going to have Spaceship Earth back the way it’s supposed to be. Thanks, Allen! Re-captioned and linked.